← It’s Oberek time !! As the girls sang, they put their arms around each other and swayed side to side. Having taken this song to their hearts, he knew they would touch the hearts of their audience, so it was added to their repertoire. 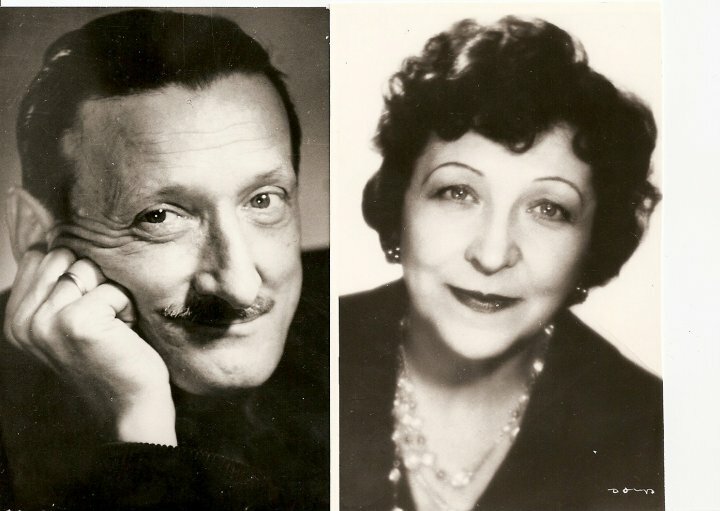 In 1948 Composer Tadeusz Sygietyński and his wife, Actress-Singer, Mira Zimińska-Sygietyńska gathered musicians from the villages of central Poland, in order to learn from them the folk music of the region. 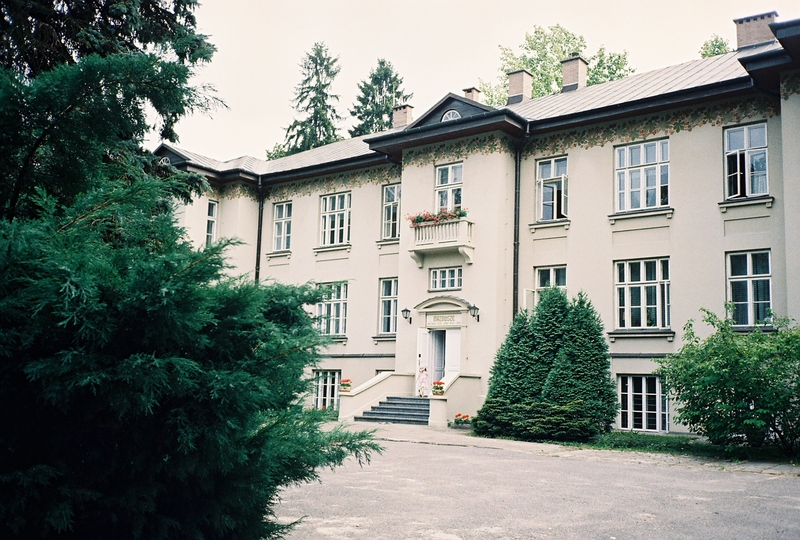 Then they brought the most talented teenagers from the countryside to an estate outside of Warsaw, called Karolin, and taught them the songs that Sygietyński had arranged for the stage. 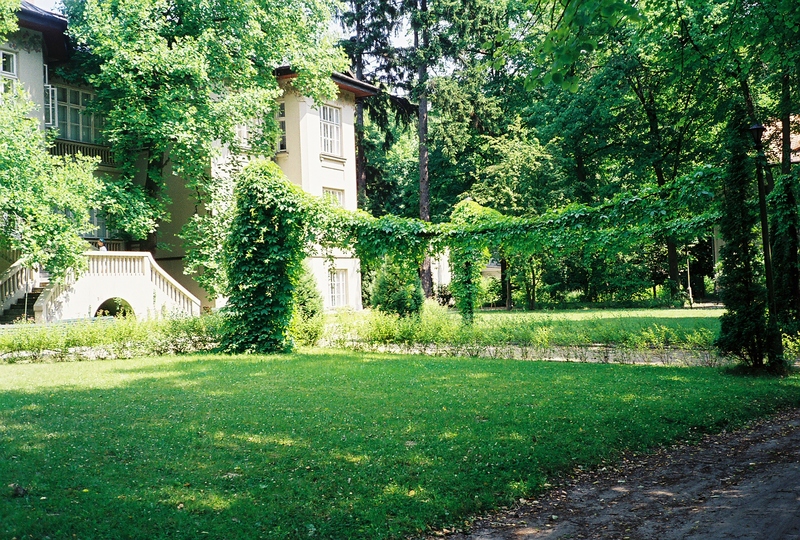 They lived at the beautiful 19th century estate, and received an education, which included the arts. The goal was to keep alive Poland’s rich musical heritage and culture in spite of Communist rule. …. 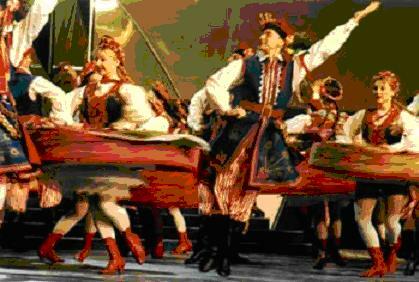 the Mazowsze Polish Folk Song and Dance Ensemble. 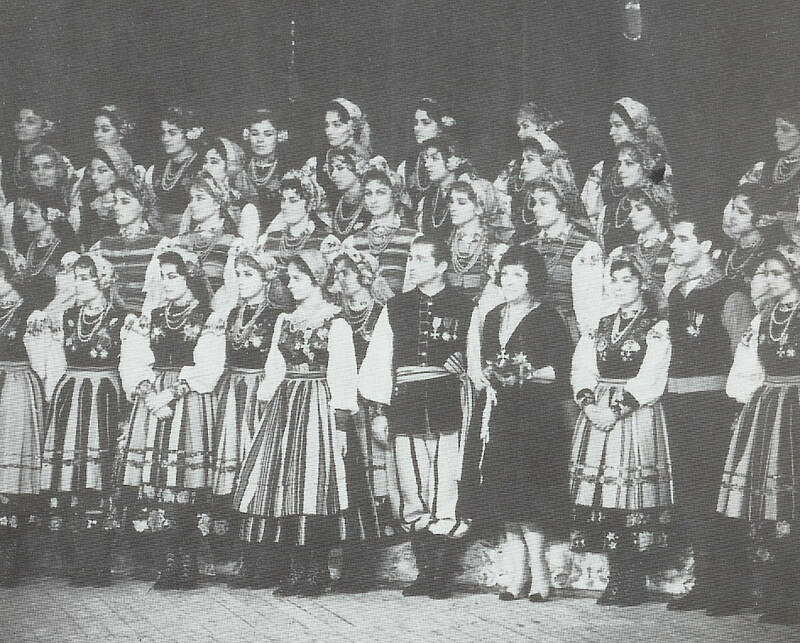 Mazowsze’s first performance was in 1950 in Warsaw, and soon they were performing throughout the world, with a repertoire that included 40 ethnographic regions of Poland. 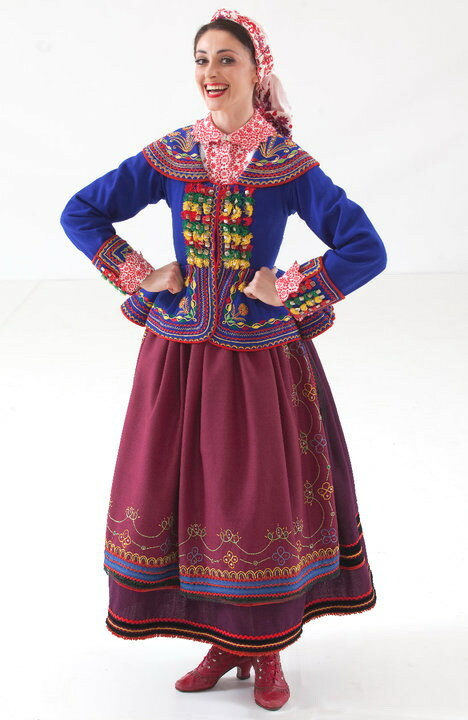 That meant that Mira Ziminska-Sygietińska had to provide the group with a variety of colorful costumes, so she employed folk artists who used natural materials to make the apparel. Meanwhile Professor Sygietyński worked with the distinctive musical styles of the folk music of those regions, creating some of the most beautiful compositions for the singers and dancers, like Mazowsze’s signature song…… ‘Ej Przyleciał Ptaszek’. 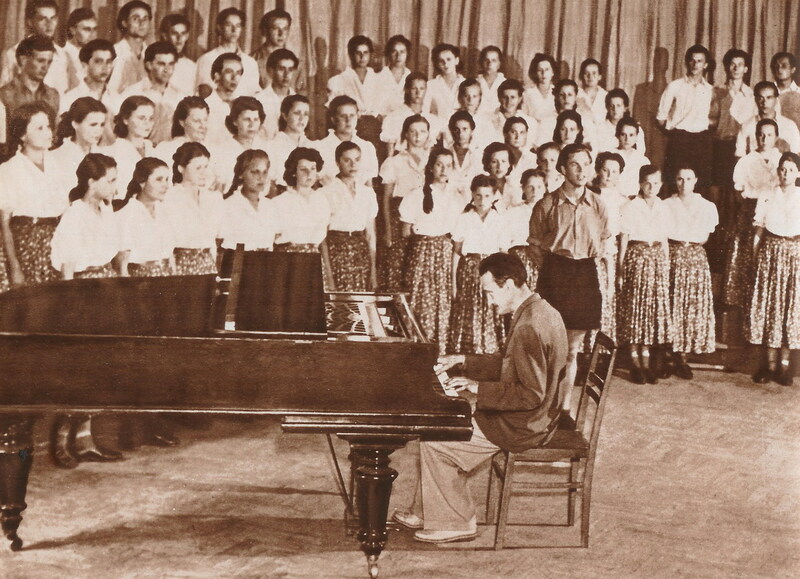 Mazowsze also performed Sygietyński’s own compositions which have themselves become a part of Polish musical folklore, like this song from the 1954 film, “Przygoda na Mariensztacie”, a film that showcased Mazowsze singers. There were other film appearances for Mazowsze, including the 1963 screwball comedy, “Żona Dla Australijczyka”, about an Australian man who comes to Poland to find a bride. He falls in love with a singer from Mazowsze, and then, mistakenly believing she would find it romantic to be kidnapped, does just that. 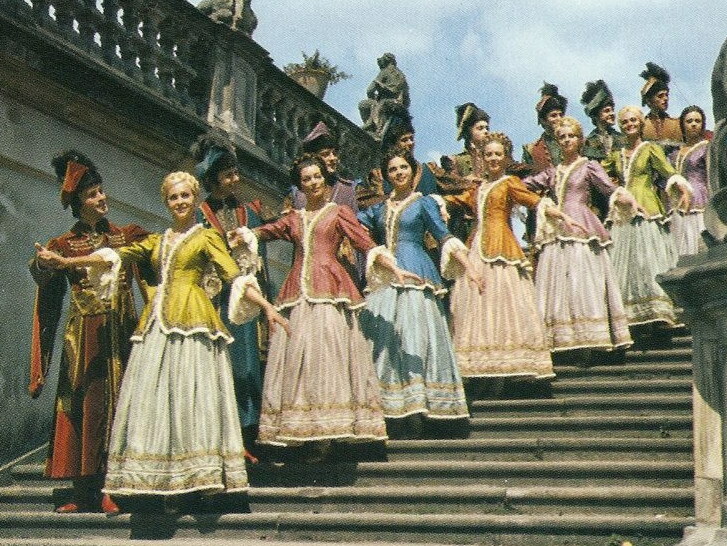 Mazowsze performs songs and dances throughout that film. Mazowsze has also made many TV appearances in Poland, like this TV special from 1971. But it is the stage where the folk song and dance troupe has its real home. As Mazowsze travels the world, Poles living abroad are reminded of the homeland that they love and cherish, while other audiences get their first glimpse of the richness of Polish culture. Mira Ziminska preferred that Mazowsze’s concerts were live, in theaters, so it was not until 2007 that a DVD video was finally recorded by the group. 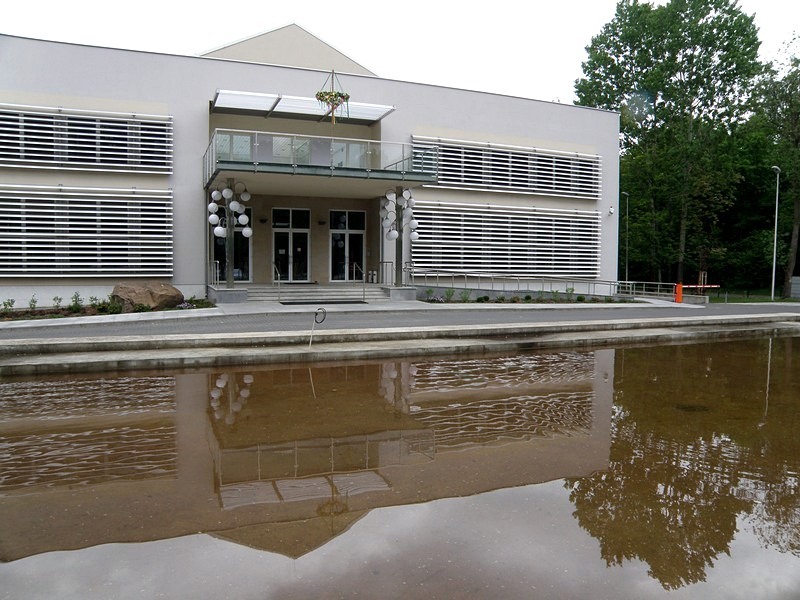 But, of course, it is still the stage where Mazowsze’s brilliance can really be experienced, and so, they have built a theater in the park complex at Karolin. Dubbed the “Matecznik”, it is part of a cultural center for folk workshops, which includes an Inn and a Tavern, in addition to the Theater. There are also brand new rehearsal halls for the performers, replacing the old rooms that have been their home since 1948. 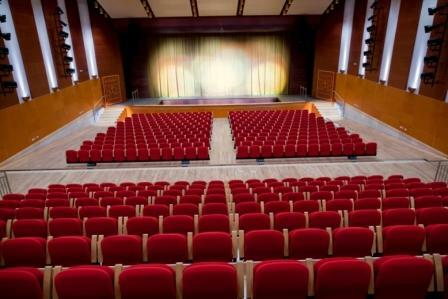 October 2009 marked Mazowsze’s first performance at the Matecznik, which will become the concert base for Mazowsze in Poland. Of course the Zespół Mazowsze continues to tour the world, and just completed a tour of North America. Mazowsze keeps in step with the modern world, while displaying the glorious musical history of Poland. They continue to strengthen the bonds of the younger generation with the tradition and artistic achievement of their forefathers. The Moral of the Story is that as Mazowsze celebrates its 60th anniversary, they are still Poland’s number one Ambassadors of Polish Culture. Gallery | This entry was posted in Mazowsze, Poland, Polish Music and tagged Bamberki, cultural center, Ej Przyleciał Ptaszek, folk costumes, folk dance folklore, folk songs, Karolin, Magnificent, Matecznki, Mazowsze, Mazowsze DVD, Mazur, Małgorzata Chróścielewska, Mieczysław Piwkowski, Mira, Pan Tadeusz, Podegrodzie, Polish TV, Przygoda Na Marianstacie, rehearsal, Stanisław Jopek, Sygietyński, Warsaw, Warszawski Walczyk, Wife for the Australian, Wilanów, Witold Zapała, Ziminska-Sygietyńska, Żona Dla Australijczyka. Bookmark the permalink. Hello! I wish to say that this post is awesome, nicely written and including all significant info. I would like to see more posts like this . Woah this blog is great i really like reading your articles. Keep up the good work! The Mazowsze came to Mexico many years ago and I have loved it ever since. It is unfortunate that we cannot find any CDs or DVDs here. I wish it will return sometime in the near future! You might be able to order Mazowsze CD’s and DVD’s from the U.S.
Hi, how’s it going? I hope you are doing well. I wanted to say that I like The Magnificent Mazowsze… in the Matecznik. I love the Mazowsze! When are they coming back to the U.S.A.? The Mazowsze are truly Magnificent! I saw them when they toured France and they were Awesome!! I sing with a Polish Group in Pittsburgh USA. I also love the Mazowsze! When are they coming back to the U.S.A.?